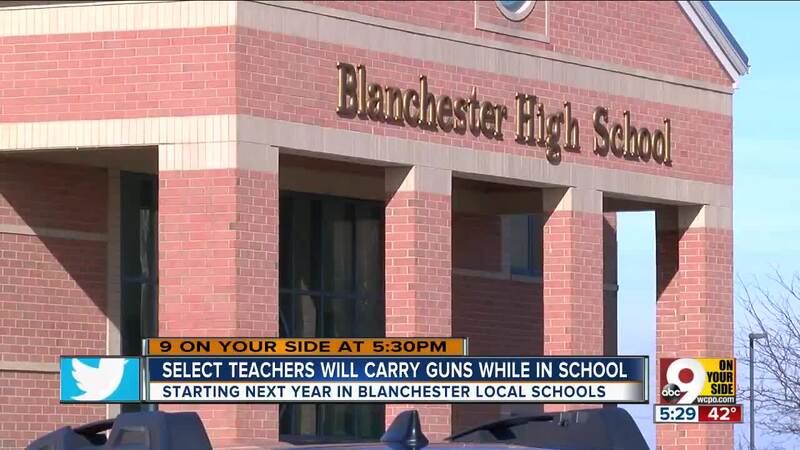 BLANCHESTER, Ohio — Some Blanchester teachers licensed to carry concealed weapons will be able to carry their firearms in schools starting next year. The Blanchester Local Schools Board of Education unanimously approved a resolution Monday allowing trained staff members to carry weapons on campuses, district officials said in a news release. The resolution doesn't allow all staff members with CCW to carry firearms in schools. Instead, officials said a select group of trained staffers will be armed in order to provide a deterrent against an active shooter situation and "limit the carnage caused by a tragedy of this nature." "The Board of Education takes the safety of our children and staff very seriously," officials said in the news release. "We feel that school safety can be dramatically enhanced by allowing certain trained individuals to possess and carry concealed firearms while on duty." Armed staffers will have to complete training with the company 88 Tactical through the Premier Shooting and Training Center in West Chester. The program focuses on active killer response, medical trauma care, mindset, general school safety and security, officials said. Staffers will also collaborate with local police and have ongoing training to remain certified. The training will be funded by a state school safety grant. Officials plan to send staff members to training over the summer so they can begin carrying weapons when children return to school in the fall. Brandon Sammons is a former teacher and football coach at Blanchester. He said he thinks the plan "is a positive." "If it means I can protect a friend's daughter or someone I know, their child, I'd be 100 percent for that," he said.